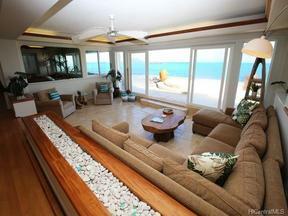 Lowest price for Lanikai Ocean front. Huge Price Reduction. Beautiful gated home with Balinese inspired furniture. Breathtaking ocean view and lush tropical landscape. Enjoy kayak, snorkel and swim. This home has been lovely maintained with owners suite and gourmet kitchen. House comes fully furnished. Enjoy all that Lanikai has to offer. Click on video icon under MLS photos for video. Based on information from the Multiple Listing Service of Honolulu Board of REALTORS&reg; listings last updated on 04/24/2019 4:38:41 AM.